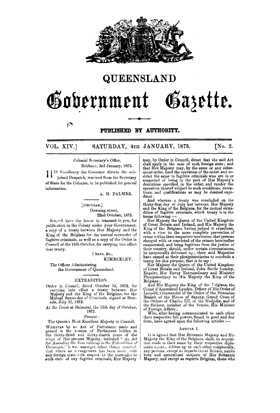 The Queensland Government Gazette contains a wealth of information on a wide range of topics; but finding information on particular individuals can be a daunting task. Each volume has an index to the Notices in the Gazette, but no consolidated index has been available to make the information more accessible to researchers... until now! This database includes the name, title, topic, location, volume, year and page(s) relating to the index entry. The actual Notice in the Gazette will provide additional information, the exact nature of which will depend on the topic. Note that the actual Notice give the full names of the persons referred to and that many of the Trade Mark and Patent Notices refer to people residing outside of Queensland - from the other Australian colonies and from overseas (England, Scotland, USA, Canada, New Zealand, Chile, France, Germany, &c). All entries have been recorded according to the information in the Gazette indexes - be aware though that there are errors in both the names and page numbers (as we discovered in checking some entries) and if you are unable to locate an entry it could be because the original index in the Gazette is incorrect. It excludes those entries which are part of other indexes compiled by the Queensland Family History Society - in particular, notices relating to Intestacy, Insolvency and Wills and Members of School Committees. This is a valuable genealogy resource not only for historians and social researchers, but for anyone exploring their family history and building a family tree.